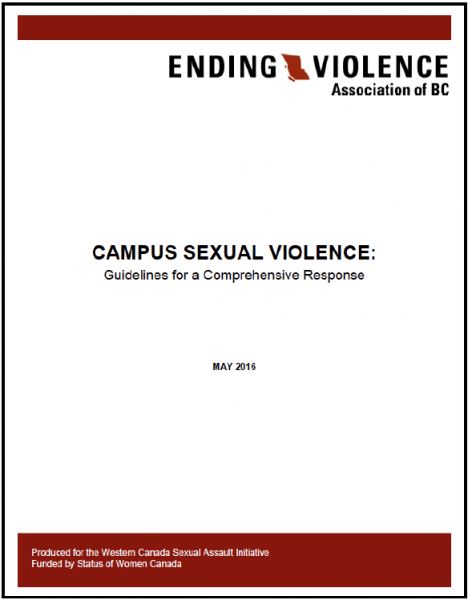 As par t of EVA BC’s Western Canada Sexual Assault Initiative funded by Status of Women Canada, Campus Sexual Violence: Guidelines for a Comprehensive Response has been developed to support university and college campus communities in their response to sexual violence. The guidelines assist in the development and revision of policies and protocols, and outline various disclosure and reporting options, services, and accomodations that may be available to survivors. They also provide guidance around confidentiality and information sharing and highlight the critical components of campus sexual assault training and education. Also available, this one-page Overview of Guidelines provides an at a glance summary of the 10 guidelines developed to support university and college campus communities in their response to campus sexual violence.